Kitchen projects are major investments. While a kitchen remodeling will likely be one of the most expensive things you can do to your home, it can also be the most valuable. If you are planning a kitchen or want to do some upgrades with a smaller budget, every decision you make, large or small, is important for your bottom line. Cabinets, appliances, and countertops are big players in your budget. Here are a few tricks to save some cash on your countertops, while still giving you an elegant and quality project. The standard way to fabricate a solid surface countertop (granite, marble, quartz) is to create a 1.5" thick edge. The material itself is not 1.5", it is .75". The material is cut by the fabricator and then another piece of material is laminated (glued) to the top piece, creating a 1.5" thickness. Behind that laminated piece on the edge, is a sheet of plywood that we call subtops. The lamination, and sheet of plywood, plus labor to do both, add to your bottom line. A cheaper, and stylish way to go, is to use only the single thickness material. This is a contemporary trend in Europe and designers are making use of it in the States as well. Save around $1,000+ for the average kitchen. 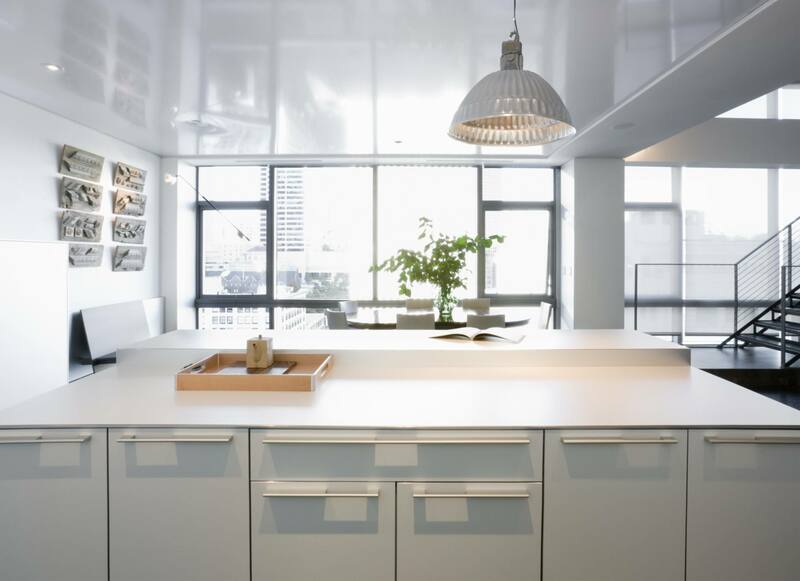 To create a high-value counter surface, it needs to be durable, long lasting and a good fit with the other elements of the project, as well as a great price. Let's say you want quartz. Quartz countertops and granite are similar in pricing, depending on the color. You can find many different colors of granite that range from dirt cheap to on-your-knees-weeping expensive. There are select colors of quartz that are in the lower price groups. For example, Caesarstone has price groups. Price group A and B give you savings over their C-F groups. Don't switch to a no-name brand of quartz countertops. Even though there may be some extremely inexpensive quartz products out there, many are made with sub-par materials and manufacturing processes. Stick to companies like Caesarstone or Silestone. The reason that some granite colors cost more than others, is their availability. If there is only a little section of mountain producing an exotic Brazilian color, it will be more expensive than a color that is more available. I'm sure you have seen them before, the basic browns, beiges and dark greens. Go take a look at your local granite stone yard and ask for inexpensive granite options. If you are being very disciplined, put your blinders on while you walk thru, and don't stop for anything else. You might just find something you like that is inexpensive, or you might want to explore some of your other options discussed here. Pre-fabricated granite is granite that comes with an edge already on it. They will have a few different edge profiles to choose from, and some 4" backsplash, if that is your taste. They will also come in the common granite colors that we just talked about. Don't skimp on the quality of workmanship. With pre-fabricated granite, you want to still make sure your fabricator comes highly recommended and does good work. Most all custom fabricators also work with pre-fabricated granites. There are size limitations that work well with perimeter installations, but if you have an island, you may need a custom slab to accommodate a larger size. Most pre-fabricated granites only come with a bullnose edge on the front edge and sides. There are several companies that make butcher block by the slab. This type of butcher block can save you money because it is not prepped for seam locations and the wood may not necessarily be hand selected for premium quality. But nonetheless, if you have a great carpenter to biscuit the joints together, it can look fabulous and save some money. Yes, people still use laminate countertops. It may not be your first choice, but for those that can't splurge for quartz or granite, laminate is a durable choice that is super easy on your budget. If you are doing a partial remodel, or only have the cash to get new cabinetry and appliances, laminate can give you the flexibility to upgrade something different down the road. If that is your game plan, don't build in a nice tile backsplash until you are ready to commit fully. Go with a 4" or 6" laminate backsplash for the meantime. Colors also vary in price, but you can find some great colors with Formica and Wilsonart. Saving money usually means some type of sacrifice or compromise, but you can still find plenty of choices for countertops on a budget. Laminate countertops may be the most cost effective and give you flexibility for future change.